The fins occupy one of three positions: normal, subterminal or terminal. These positions are determined by the position of the fins relative to the muscular mantle (i.e., that portion of the mantle that is involved in locomotion). These definitions are not compromised, as explained below, by the presence of a tail. The normal position of the fins is the most common position found in squids. The fins terminate posteriorly approximately at about the same position the muscular mantle or usually just beyond it. However, the distance that the fin extends beyond the muscular mantle must be less than 50% of the fin length. The arrows in the drawings show the approximate position where the muscular mantle terminates. Figure. A - Onychoteuthis borealijaponicus (Onychoteuthidae) modified from Young, 1972. B - Abralia andamanica (Enoploteuthidae) modified from Voss, 1963. Fins in the terminal position have 50% or more of their length located posterior to the termination of the muscular mantle. The arrows point to the region where the muscular mantle terminates. Figure. 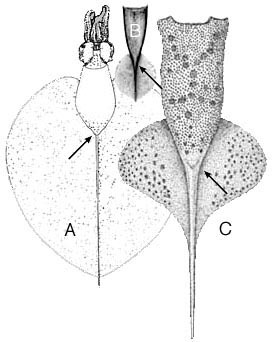 A - Magnapinnidae pacifica (Magnapinnidae), from Vecchione and Young, 1998; B - Chiroteuthis veranyi (Chiroteuthidae), from Roper and Young, Tree-of-Life, 2000. 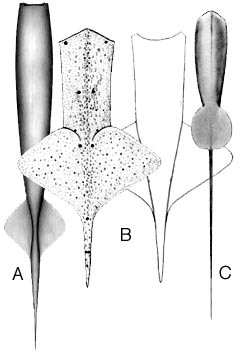 C - Pholidoteuthis adami (Pholidoteuthidae), from Goldman, 1995. Fins in the subterminal position terminate posteriorly before (anterior to) the termination of the muscular mantle. This position is not common in squids but is found in many sepioids. Figure. 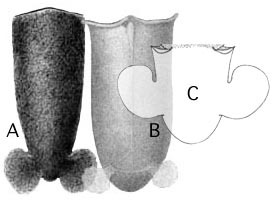 A - Bathyteuthis abyssicola (Bathyteuthidae) modified from Roper, 1969. B - Bathothauma lyromma (Cranchiidae) modified from Chun, 1910. C - Euprymna stenodactyla (Sepiolidae) modified from Voss, 1963. A tail is a posterior extension of the body beyond the Fins. 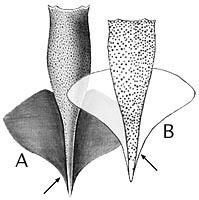 The tail does not incorporate any of the primary mantle musculature; it lies posterior to the termination of this part of the mantle. The tail can be a short, broad, fleshy extension of the body (e.g. Enoploteuthis) or a long, slender extension composed mostly of skin that is supported by the gladius (e.g. Joubiniteuthis) or some other material (e.g. male Lycoteuthis. In some cases the fin gradually diminishes along the side of the body which makes the anterior end of the tail difficult to pinpoint. Figure. A - Batoteuthis skolops (Batoteuthidae) from Young and Roper, ToL, 2001. B - Joubiniteuthis portieri (Joubiniteuthidae) from Young and Roper, 1969; C - Lycoteuthis springeri (Lycoteuthidae), male, from Voss, 1962. dorsal view (left), ventral view (right). Goldman, D. A. 1995. A juvenile of the scaled squid, Pholidoteuthis adami Voss, 1956 (Cephalopoda: Oegopsida), from the Florida Keys. Proc. Biol. Soc. Wash., 108: 136-146. Roper, C.F.E. 1969. Systematics and zoogeography of the worldwide bathypelagic squid Bathyteuthis (Cephalopoda: Oegopsida). Bulletin of the United States National Museum, 291:1-210. Voss, G. L. 1962. A monograph of the Cephalopoda of the North Atlantic. I. The Family Lycoteuthidae. Bull. Mar. Sci. Gulf Carib., 12: 264-305. Voss, G. L. 1963. Cephalopods of the Philippine Islands. Bull. U. S. Nat. Mus., 234: 1-180. Young, R. E. and C. F. E. Roper. 1969. A monograph of the Cephalopoda of the North Atlantic: The family Joubiniteuthidae. Smithson. Contr. Zool., No. 15: 1-10. Page: Tree of Life Cephalopod Fin Position Authored by Richard E. Young, Michael Vecchione, and Katharina M. Mangold (1922-2003). The TEXT of this page is licensed under the Creative Commons Attribution-NonCommercial License - Version 3.0. Note that images and other media featured on this page are each governed by their own license, and they may or may not be available for reuse. Click on an image or a media link to access the media data window, which provides the relevant licensing information. For the general terms and conditions of ToL material reuse and redistribution, please see the Tree of Life Copyright Policies.